“Haus unterm First” throughout the changing times. Our property was the first one to be built on the hill called “Flachsröste” on a beautiful site with a good view. The name “Flachsröste” is derived from the early usage of the spot. Up to the middle of the 19th century flax ( = Flachs) was cultivated in the area. Numerous fields where the plant with its blue blossoms was grown made the “Allgäu” look like a huge blue sea. There were several small ponds on the hill where our house is situated now. These ponds were used to dip in bundles of flax which were then put out to dry – or roast ( = rösten) – late in summer on the warm, sunny hill. This hill is situated directly below an area called “First” = ridge, which is the ridge of Oberstdorf to the east. 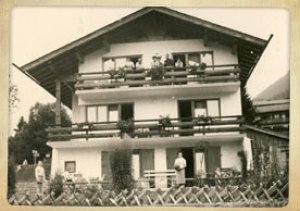 Therefore our house was called “Haus unterm First”, House beneath the Ridge. In 1958 the first guests arrived, usually looking for a “Bed and Breakfast” or a room with a view. Many became regular guests, often staying with us both in summer and in winter for more than 50 times. 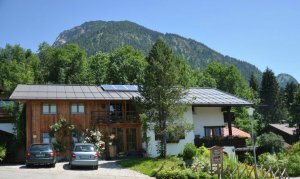 In 2004 the house was renovated and modernized, a beautiful annex was added in an alpine style in order to create four appealing holiday flats, which are very popular with our guests, many of whom have become regulars.